I am not a neuroscientist; this blog post is not written with appropriate scientific method. This post is written based on my personal understanding and could reflect deficiencies experienced in my own personal learning process. To begin we should evaluate what a younger version of myself experienced in the learning process. As a child, picking up certain ideas and applying them just sort of came naturally to me. Whereas other ideas were best suited for the minds of my friends. But why? I used to think it was based on my ability to learn. Teachers used my IQ to recommend me for advanced courses, and such avenues awarded me the ability to attempt learning more difficult topics. But even then, I often felt my mind drifting off in class, doodled on notes, or encountered moments where I was not motivated enough to attempt to process the course content. Our learning instruction we receive from youth into early adulthood is fairly regimented; teachers are taught how to convey information to students, and for the most part, they engage in the same methodology across their efforts. Do the one-size fits all approach not work? The answer is: it’s complicated. People learn at different paces and best with very different methodologies. Some people are able to see something once, and commit that piece of knowledge into their memory for the rest of their lives. While, others must spend days scrutinizing a tidbit of information to determine its worth, write the virtual book, and shelf it in the library stacks in their mind. The best instructors and course developers are able to evaluate how their student’s learn and cater their offerings to get the best out of the situation. Scientists have embarked on the challenge of truly determining how we learn. This research may one day, reshape the conceptualization of the Learning Management System. The whole process is fascinating, and worthy of a quick Google search if you’re so inclined. However, for this post, my purpose is to let you know different ways in which people can learn and currently do. If you fall asleep on your book or learning materials, it turns out a magnet doesn’t fall out of your head and absorb the metallic printed material on the page. Also, the practice may aid in the process, but memorizing definitions for a quiz is most likely not going to yield long-term results. So, what are good practices we can instill in our corporate learning environments that will ensure the highest level of safety, the greatest output, and best compliance to corporate guidelines? There are five major types of learning styles. People are said to either be an auditory (learn through hearing, can recollect a majority of information presented to them in lecture), visual (learn through seeing or reading, can recollect a majority of information presented to them in written/ presented form), tactile or kinesthetic (learn through hand’s on training, this is how a process is done from start to finish), global (big picture first – attribute detail when needed) or Analytic learners (Detailed oriented, like hearing or seeing as much information as possible in reference to processes or content). I personally am a bit of a hybrid, I start as a global learner and apply an analytical style of learning when I find topics that interest me. But I’m also very adept to visual learning. If I read or see something, then there is a good chance I will be able to recall important factors of what was presented. Knowing this has aided me immensely in my quest for knowledge. Knowing what style your employees are can yield unexpected positive outcomes in your business process. So how do we cater to these five major types of learning styles? Be open to the idea that even in the corporate world, people are not going to be completely onboard with your style of learning. Do not be afraid to survey your department: People know how they like to learn. If John in Marketing learns best via Instructor-Lead training, and Suzy in Document Control works best in an impersonal self-instructed pathway. It is best to accommodate their needs. Work with individuals who need more personal attention. As the sum of knowledge in your department can one day be the difference in universal sales across channels, to observing breaks in the chain. YouTube videos are easy, and often times, there is a great video available in relation to what you would like to instruct about. E-Learnings can quickly instruct and measure user issues with content, and let you know what further actions may be necessary. Images are a great way to reinforce verbalized and written processes. Consider Instructor lead training to add the human effect of seeing learning styles first hand. Use language that relates to the user. Why do I care about 55 oranges and 16 coconuts? Be able to write what you want the user to learn in a plain language. Testing on the definition of a compliance article does not ensure that the user understands that article of compliance. Use gamification to incentivize users. Learning differences in some ways can be overcome via a great deal of effort. If users obtain results from appeasing their competitive streak, then, by all means, this should be incorporated in your learning designs. Join me as I continue to tackle the realm of learning and best relate these processes and suggestions to the industry. 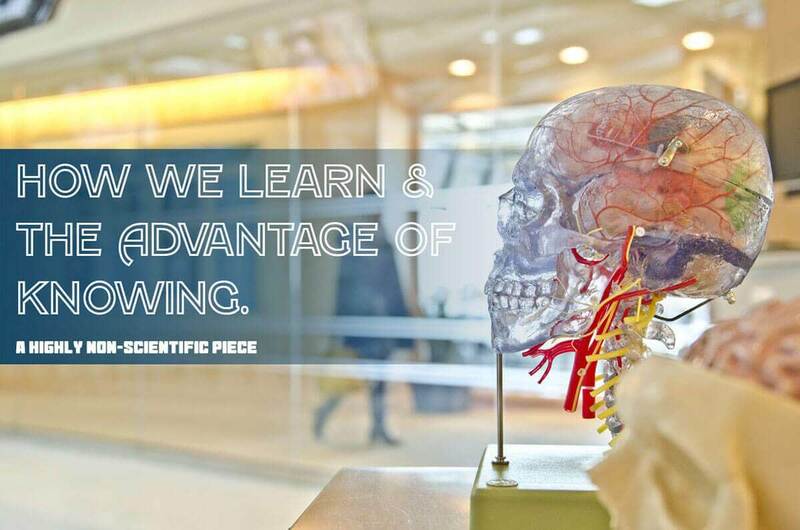 Knowing how we learn, can only support our abilities to better serve our employees, clients, and stakeholders.